“Working-class voters tried to send a message in 2016, and they are still trying to send it,” writes columnist David Brooks (New York Times, 11/8/18). By “working class,” he means “white working class,” since people making less than $100,000 voted decisively for Democrats in 2018. 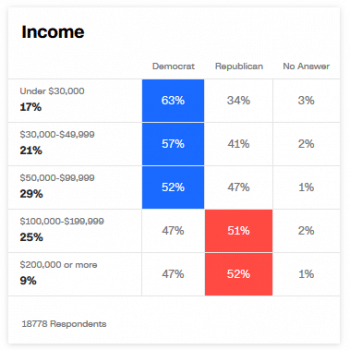 Since the 2016 elections, corporate media narratives about U.S. politics have fixated on the “white working class” as a pivotal demographic, presented as a hardscrabble assortment of disaffected outsiders. Piece after piece has been published in establishment outlets attempting to decipher the motivations of this racialized socio-economic group, depicted as fighting from the Heartland against “cultural elites” on both coasts. Mr. Trump’s success among white working-class voters spanned much of the Midwest, powering victories in Michigan, Wisconsin and Ohio…. Here in Iowa and elsewhere, [Democrats] are also making appeals to small-town voters who went for Mr. Trump. But the biggest explanation for the shifting numbers…is that the portions of the white working class hostile to Trump appear somewhat more likely to vote next month than those who support him. 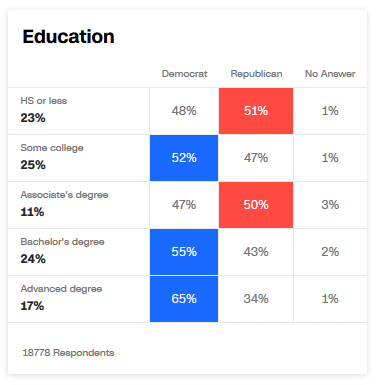 If you’ve seen a piece on the impact of the working class on the midterm elections, it has most likely dealt specifically with working whites. But the media focus distorts the composition of this class, racially and otherwise. As Sarah Jaffe points out in the New Republic (8/22/18), “Only around 11 percent of the working class are white men in industrial jobs.” Americans who make their living by selling their labor (mostly in the service industry) are in fact disproportionately people of color, who are projected by the Economic Policy Institute (6/9/16) to constitute an outright majority of the working class by 2032. 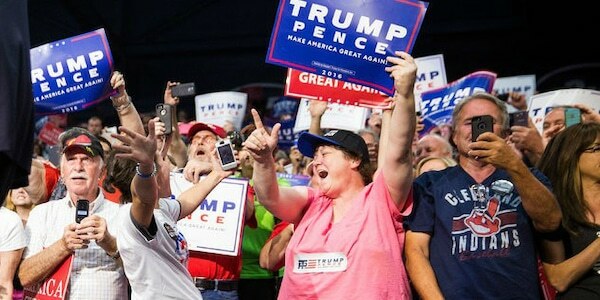 This misrepresentation of working-class whiteness extends to discussion of the voting habits of organized labor, as in a Washington Post piece (10/10/18) speculating that Sen. Sherrod Brown’s pro-union rhetoric in Ohio might help Democrats “reverse the flight of the white working class to President Trump.” Though the typical union worker is often depicted as a gruff white man nearing his 50s, union membership is more common among African-American workers than whites, at 13.0 percent vs. 10.5 percent. Despite the significant number of people of color in the working class, non-white members of this class are rarely talked about as such. 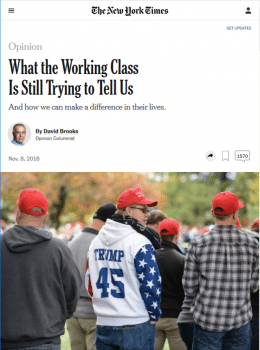 While use of the phrase “white working class” has been ubiquitous in political journalism in the lead-up to the 2018 midterm elections, the “black working class” is discussed much less often. While the New York Times will occasionally put out a piece with explicit analysis of working people of color—including one op-ed by Tamara Winfrey-Harris (6/16/18) and another by Alexis Okeowo (6/2/18)—they are few and far between compared to the multitude of pieces published on their white counterparts. This promotes a homogenous image of the working class as sweaty, middle-aged white men in hard hats, with MAGA bumper stickers on their pick-up trucks and a fear of social change in their hearts. This depiction erases the multitude of working people who do not meet this stereotype, and ignores the fact that the working class has far more people of color and more women than the professional and ownership classes. Because Mr. Trump drew support from white voters with less formal education—the “white working class”—many attributed his victory to Americans’ economic anxiety. moderate, pro-gun, pro-life voters in counties across the Great Lakes Rust Belt…. [who] turned out to vote for Barack Obama twice and then later voted Donald J. Trump. She explains that despite an incumbency advantage and a large number of registered Democrats, the sitting executive came very close to being voted out. Zito’s solution is to elect more conservative Democrats—“Democrats need the Kathy Dahlkempers of their party to win all kinds of races up and down the ballot”—despite starting her piece by pointing out that the incumbent just barely won. Media narratives of the political landscape leading to the 2018 midterm elections constructed an image of the “working class” in popular culture that actually depicts the white, comfortable, culturally conservative small-business class. This stands in the way of building a politics which simultaneously addresses issues of race, class and gender—which, as has previously been argued by FAIR (6/23/17), will be essential in building a progressive alternative. John McCullough is an intern at FAIR and a writer based in NYC. He is currently finishing his undergraduate degree at Fordham University. You can follow him on Twitter @eggsandmarxism.